Have a large family of 10? Or bringing along cousins, kids’ friends, or grandparents? 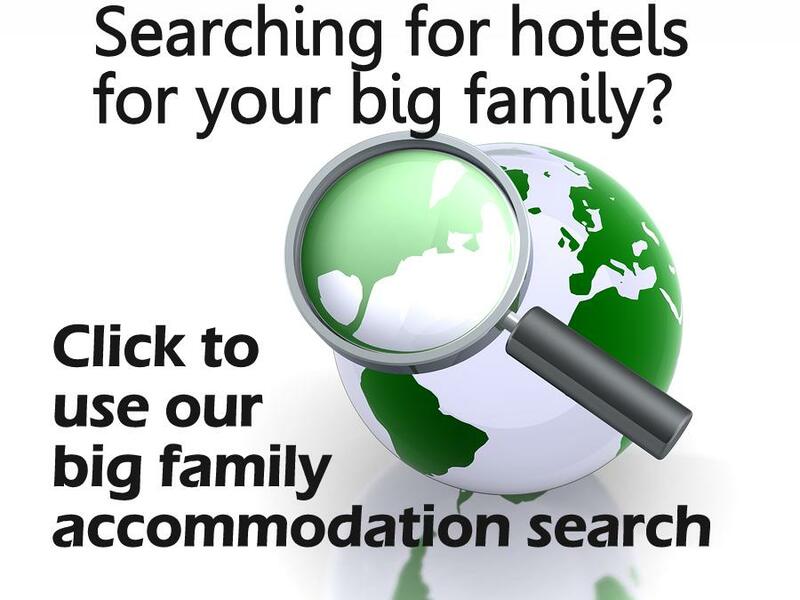 Finding hotels for families this size can be hard. 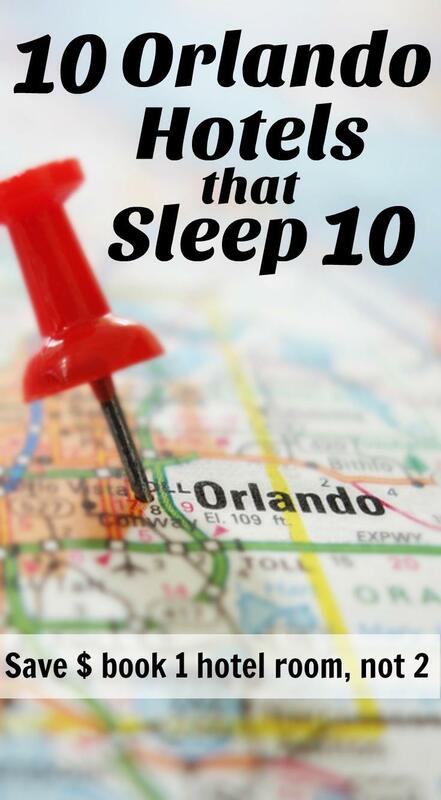 I checked our hotel listings for big families to find these 10 great properties that will sleep large families of 10 in the Orlando area. Enjoy! Situated an 8-minute drive from Walt Disney World® Resort, Lighthouse Key Resort and Spa is a pleasant base for exploring Orlando’s theme parks. Universal Studios and Wet ‘n Wild waterpark are both within a 25-minute drive, as is the Orlando Museum of Art. With living and dining areas, as well as covered patios, the 2-, 3-, and 4-bedroom condos offer ample space for families or groups. Four bedroom condos sleep families of 10. Fully equipped kitchens, washer/dryers, and free WiFi add convenience, while multiple flat-screen TVs mean everyone can watch their favorite shows. 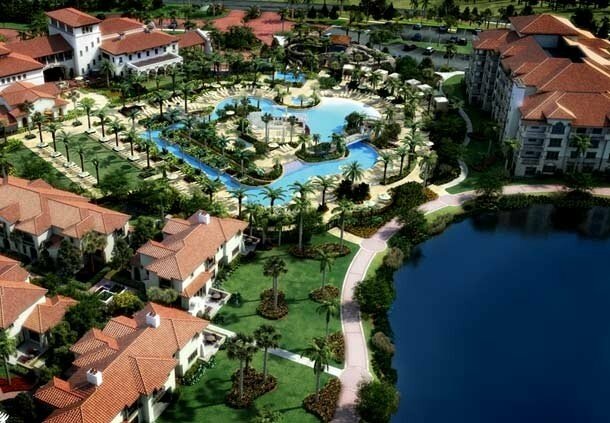 Marriott’s Lakeshore Reserve has a golf course, an outdoor pool, and a 24-hour fitness center. Complimentary wireless Internet access is available in public areas. 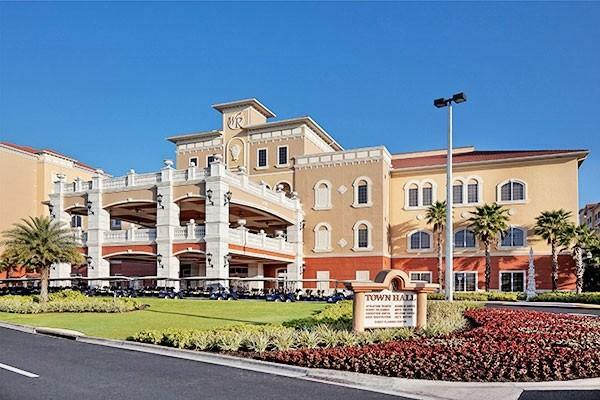 This golf condominium resort offers a restaurant, a coffee shop/café, and a bar/lounge. Additional amenities include gift shops/newsstands, barbecue grills, and a grocery/convenience store. Self-parking is complimentary. Featuring 2- and 3-bedroom multilevel townhomes and 1- to 3-bedroom villas, Marriott’s Lakeshore Reserve offers accommodations that sleep families of up to 12. Guests can use the in-room complimentary wireless high-speed Internet access. Televisions are equipped with cable channels, DVD players, and pay movies. In-room microwaves and refrigerators are provided. Built on one of the highest elevations in the area, Mystic Dunes Resort and Golf Club is nestled over 600 acres of rolling hills all while featuring lush Florida nature preserves and beautiful tropical landscaping. This family resort is only two miles from the Walt Disney World Resort. This resort is also in close proximity to Universal Orlando Resort, SeaWorld, and other exciting attractions in the Orlando area. Mystic Dunes Resort and Golf Club offers a plethora of services and amenities to make the guest`s stay as easy and relaxing as possible. After a day at the parks or for guests who just want to unwind, this resort offers 4 swimming pools, including Dunes Lagoon, which features a two-story water slide and private cabanas. Three bedroom villas can sleep 12 guests. The resort is less than 2 miles from Universal Studios, SeaWorld, Orlando Convention Center and International Drive. Walt Disney World is only 5 miles away. In addition, shopping and dining options are within walking distance of the resort. Onsite food and beverage outlets such as Smokehouse Grill, Sids Deli, Pizza pickup/delivery, The Marketplace and the main pool bar are also available to guests staying at the resort. Children ages 2-12 are invited to visit the Kid’s Club for supervised fun while parents enjoy some time off. The Kid’s Club features video games, arts and crafts, board games, organized fun and a friendly staff dedicated to the supervision of children. The resort’s top-notch spa, 7 pools, marina with kayaks, and mini-golf course mean there’s plenty to do whether you’re looking to relax after a long day at the parks or to keep the fun going. Big family friendly rooms range from studios to 3-room villas that can accommodate 12 – and several include kitchenettes, sofa beds, and washers and dryers. Westgate Town Center Resort & Spa provides big families all the comforts of a fully furnished home just 1 mile from Walt Disney World® Resort and minutes from other Orlando area attractions. Big families will appreciate the multiple accommodation choices – ranging from cozy studios to over-sized four-bedroom villas that can sleep up to 16. A multitude of onsite amenities are available including two on-site restaurants, 14 heated outdoor pools, and Ship Wreck Island Water Park. On-site activities include basketball and tennis courts, bicycle rentals, a game room, horseshoes, a kid’s club, a playground, shuffleboard, mini golf, boat rentals, and volleyball courts. The Westgate Vacation Villas Resort is a great place to stay while being only minutes from Walt Disney World and other Orlando area attractions. This resort offers so many amenities that everyone will find something they love to do, like swimming in one of the 14 outdoor heated pools or quietly fishing in the lake. Additional amenities include a children’s pool, a children’s club, and an arcade/game room. The 1184 air-conditioned guestrooms at Westgate Vacation Villas include coffee/tea makers and hair dryers. Two bedroom villas can sleep families of 10. Guests can use the in-room complimentary wireless high-speed Internet access. Televisions are equipped with premium satellite channels and DVD players. Bathrooms offer bathtubs or showers and complimentary toiletries. All units feature microwaves and refrigerators. Additional amenities include irons/ironing boards and ceiling fans. Housekeeping is offered weekly. The Lake Buena Vista Resort Village and Spa feature spacious one to four-bedroom condominiums and a large Pirate Ship pool area. Situated just 2 miles from Walt Disney World, 4.5 miles from the aquatic adventures at SeaWorld Orlando and 8 miles away from the thrilling rides at Universal Studios and Islands of Adventure. Take a swim in the zero-entry themed pool with a Pirate Shipwreck featuring shooting water cannons, a water slide, Jacuzzi-style hot tubs, tumbling waterfalls, poolside loungers and hammocks. All suites are designed to lavish guests with incredible amenities including over-sized bedrooms, living rooms with big screen TVs, fully equipped kitchens, and private balconies with phenomenal views of Orlando and beyond. Four bedroom suites sleep families of 10. 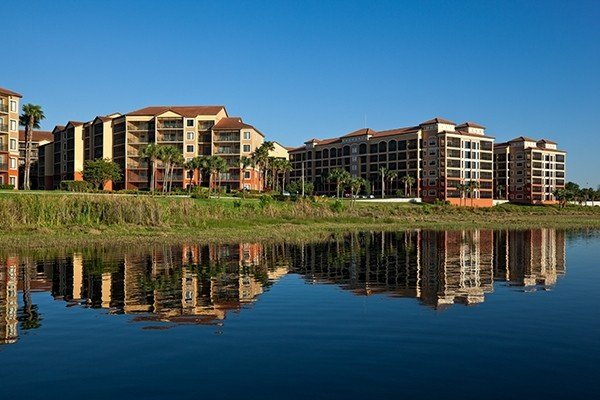 This big family friendly International Drive condominium resort is located on 54 acres surrounding Lake Eve. The property includes an indoor/outdoor pool in addition to the 75,000-square-foot Wakoola Springs swimming area, featuring 2 twisting water slides, interactive fountains, and a zero-entry pool. Poolside dining is available. An immense 20,000-square-foot clubhouse includes a game room, kids’ activity room, fitness room and outdoor relaxation garden. 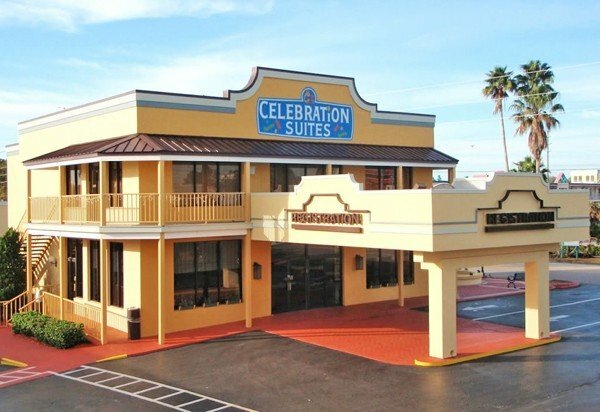 Celebration Suites offers many services and amenities to guests to make their stay as enjoyable as possible. Guests should take advantage of the complimentary scheduled transportation to Walt Disney World, Universal Studios, and SeaWorld for a less stressful vacation. There are three outdoor pools, two of them heated during the winter months. The children will never be bored with the on-site game room, putting green, ping-pong tables, and playground available to them. Superior two bedroom suites can sleep families of 10 and come with a well-equipped kitchen that includes a full-sized refrigerator, microwave, dishwasher, and two-burner stovetop. Wi-Fi is available in the suites for a nominal fee. Holiday Inn Hotel & Suites Across From Universal Orlando has an outdoor pool, a 24-hour fitness center, and a children’s pool. Wireless Internet access is complimentary in public areas. Dining options at this family-friendly hotel include a restaurant and a bar/lounge. Additional amenities include an arcade/game room, multilingual staff, and gift shops/newsstands. Self-parking is complimentary. The 390 air-conditioned guestrooms at Holiday Inn Hotel & Suites Across From Universal Orlando include complimentary newspapers and coffee/tea makers. Complimentary wireless high-speed Internet access is provided. 32-inch LCD TVs are equipped with premium satellite channels, video-game consoles, and pay movies. All units feature microwaves and refrigerators. Additional amenities include hair dryers and irons/ironing boards. Families of 10 will want to book the 2 Bedroom suite with 4 double beds and sofa sleeper. Theresa is the mother of four including twins. She is the owner of SixSuitcaseTravel, a travel site for big families of 5, 6, 7, 8. She enjoys helping other big families build life-long travel memories. Her family's travel bucket list includes DC (done! ), Yellowstone, London and anywhere in the Caribbean.